It’s Cathy from My Book a Day. Traveling with our three kids (18, 12, and 4) is always an adventure! Part of our summer adventures this year took us to the Oregon Coast. It’s a place we’ve been – and loved – before. This year we only ventured as far south as Tillamook, and as far north as Astoria. We made Seaside our home base for two nights. We took day trips to the spots we wanted to see. I have a friend that lives in Seaside and she gave us all the inside information on what to see and do this time. It was a lot of fun to check out what the locals do. Here are a few of our favorite places on the Oregon Coast. In Tillamook, we stopped at the Tillamook Cheese Factory. We’ve been there before. They have a factory where you can see how my very favorite cheese is made. You can also get some ice cream. They have all kinds of dairy items you can buy or even sample in their factory. We missed the opening of the new factory by just one week. That was a bit sad. If you go, make sure to try their grilled cheese! We also headed out to see Cape Meares. There’s a beautiful view of the coast from there! The day we visited, there were some people with the Forest Service showing everyone the wildlife with their binoculars. There’s no way we would have seen the birds they showed us on our own, so this was really special! 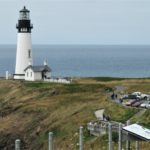 While you’re at Cape Meares, make sure to visit the beautiful lighthouse! They have tours. And walk out to the Octopus Tree as well. Our next stop was at Hug Point. Our kids loved playing in the sand. This was our 4 year-olds first real time playing at the beach and he had a blast! We wandered around the point to the north, where there is a small waterfall. Watch the tides, though, since you can be trapped by high tides at Hug Point if you’re not careful! There are so many things to do in Seaside, Oregon. Wander Broadway Street to check out all of the fun little shops and make sure to stop and get some ice cream at Sea Star Gelato. I loved the Promenade at Seaside. It would be so much fun to rent a Surrey Bike, ride along the Promenade, and take in the ocean views. But, alas, the bike shop was closed the day we were there. Another idea, one we’ve had a great time doing, is renting paddle boats on the Necanicum River that runs through town. For a fun photo op, be sure to stop by the huge beach chair at the Seaside Visitor’s Center. Ecola State Park is a must see place. It costs $5 a car to get in, but it’s well worth the price. Get there early for the best parking places. We took a short hike through the woods at Ecola and we loved it. There are amazing views of Haystack Rock from this park. Make sure to check it out! Cannon Beach and Haystack Rock are pretty much the most iconic things along the Oregon Coast. We made a quick stop there. I was glad we found a place to park and get out. Haystack Rock can be a very busy place, so get there early. We spent some time playing in the sand there again. Astoria, Oregon is a little town full of character. A couple of really fun things to visit are the Astoria Column and The Riverfront Trolley. The Astoria Column sits on a hill above the town. From the platform at the top of the 125-foot column, you get great views of Astoria, the Columbia River, and the surrounding mountains.. They charge $5 to park at the column, but it’s good for a year.. There is a gift shop onsite, and there may sometimes be a food cart as well.. The Riverfront Trolley may have been our favorite thing we did in Astoria this time. We loved the restful pace of this. They ask for a small donation when you ride the trolley, but it’s my favorite way to hear about the history of Astoria. The trolley drivers talk about how life would have been and the many buildings along the tracks. There have been several movies filmed in Astoria. Most notable are The Goonies and Kindergarten Cop. Another fun thing to do is to check out the places that were used in the movies. You can go to the Goonie House and to the school used in Kindergarten Cop. Ecola State Park was also the site of one of the scenes in Kindergarten Cop. The Astoria Visitors Center has audio tours and information on filming locations. One more really fun place to visit is the wreck of the Peter Iredale. It’s located in Fort Stevens State Park. We stopped for a little bit to see the shipwreck, play in the sand and watch the waves come in. There are so many things to do on the Oregon Coast. This is just a tiny sampling. Make sure to check it out for yourself!